153.22mph The fastest speed achieved by a 1004/ EVER! 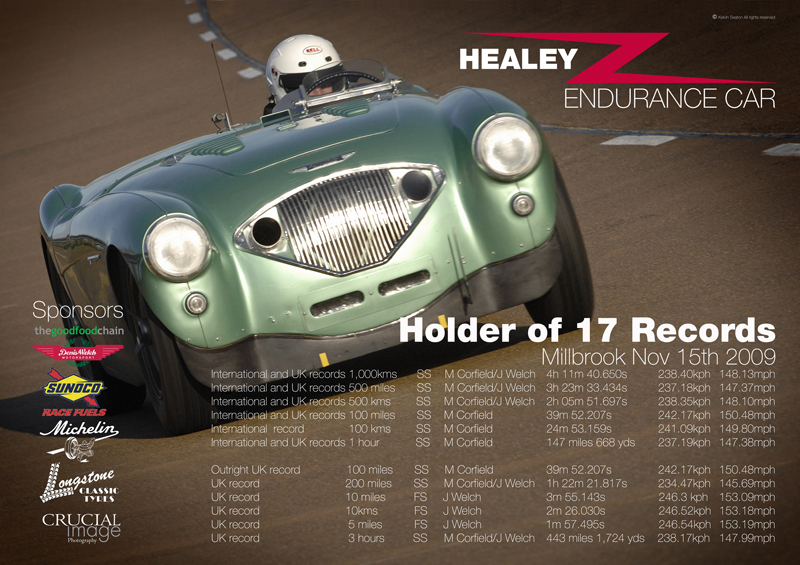 Sunday 15th November 2009 saw the 'Healey endurance' car rebuilt by Denis Welch Motorsport succeed in achieving the International Speed record for 1000 Km (International Group 2 Class 8 non supercharged). 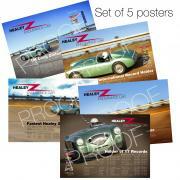 The ambition was to beat the non-supercharged 4 cylinder records set by the Healey works team in 1954 at 132 .81 mph. So mission accomplished. The car had a trouble free run with 3 scheduled pit stops and was driven by owner Martyn Corfield and Engineer Jeremy Welch in 4 stints of one hour each. A further pit stop was made after Martyn spun across the track at 150 mph by the damp surface from the previous days torrential rain and howling gales. After such a mind numbing moment he was still able to gather the car, losing no speed and after a safety check carry on unabated to the next scheduled stop. Points and condenser were used and a lot of old technology in keeping with its traditional heritage, a lot of hard work and effort was put into building this car by the Denis Welch Motorsport team and as no one had done this for 55 years, painstaking research and committment to detail were a high priority. This wasn’t the only Healey Endurance car on the scene at the time, an Australian Team led by Steve Pike built a similar car and ran it at Bonneville speed week in Sept 2009 but could only achieve 127mph against the UK cars 153mph. Even their streamliner with a supercharged engine couldn’t beat the UK cars outright speed achieved over 10 miles. This is a great testament to the power developed by the Welch engine. 1000 Km Record PosterThis has been a dream come true for owner Martyn Corfield who always wanted to own the original Healey works car but his ambition was thwarted when he discovered that it was scrapped in the late fifties. Now he has his own piece of history. But that's not the end for him, as he is resurrecting the ‘Atalanta’ car brand with recreated cars and a new speed record car on the agenda for launching in the next 12 months. “ To achieve the 1000 Km record was the objective and we have handsomely beaten the 1954 record and to our amazement set the fastest 100 miles ever in the UK. I am absolutely over the moon with the results particularly given the weather. It’s the fastest Healey in the World in 2009 and a big milestone in the development of historic performance cars something I intend to repeat with Atalanta Motors”. UK Long distance records posterAs for Constructor and Co-Driver Jeremy Welch, his business in Yoxall continues to produce some of the best race, rally and performance cars that regularly beat the competition all over the world. This project has been a monumental achievement, given that he has also kept a thriving business at the front of the grid and is developing technologies to further improve future customers results including bedding in a state of the art CAD/CAM system. 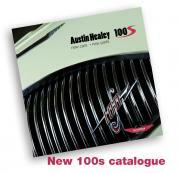 We have the experience and a host of new parts suitable for original cars also, and all this is in our 100S brochure. It is FREE to anyone wanting one and contains much of the story of the Endurance car development. After the works 1954 records, the Healey 100S was announced to commemorate the event and 50 were made as a celebration model, they now are much sought after, fetching incredible prices. Thanks must go to Michelin tyres and their distributor Longstone tyres whose products never let the team down and Sunoco for supply of fuel and pumping equipment.